The first edition of Melway was released in 1966 after 5 years of production and contained 106 original hand drawn maps. 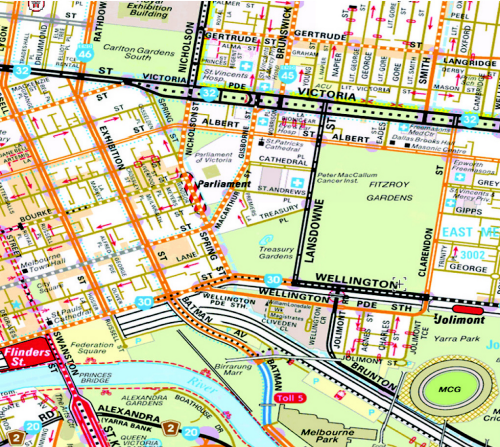 Now in its 39th edition (http://www.melway.com.au/), the map was created in response to shortcomings in available directories at the time. By the 1980s Melway was the most popular street directory in Melbourne. The maps are designed with a rich and diverse palette of colours, from the blue suburb names to the bright orange secondary streets to the black major roads giving clarity to distinct features. The publication was awarded the International Cartographic Association award in 1982 and the inaugural award for cartographic excellence by the Australian Institute of Cartographers. Street labeling is positioned above the roads, instead of being placed within the road which was against the market trend at the time. Type hierarchy, positioning and colour provided space in which to label a wide range of contextual information. The maps maintain an often imitated ‘house style’ and it has become so ubiquitous that it’s not unusual for people to give a Melway grid reference as directions.